My toddlers love babies even Son Son who's word are limited says baby. 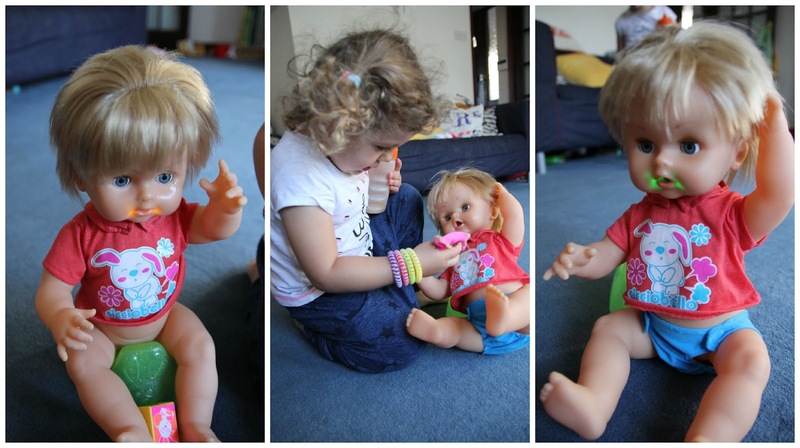 So when we were offered the chance to review a toy baby I could not say no. I thought it may be just a doll but it is actually so much more I was more than impressed and so was Ami. Cicciobella Rumbly Doll is a new doll for 2015 and comes with many awesome features which I will mention a little later. It came in a massive box in which I had to hide somewhere as I didn't want them to see whilst I wasn't there. When I got it out there were a few tears of frustration as I couldn't get the bits out faster, and like most of our reviews is usually wrestled by two toddlers. I was really impressed at the size of the box, I know toddlers love any large box regardless of what is in it. The Cicciobella Doll in which Ami named Tommy comes with some accessories. A potty, two clothes, a spoon, juice bottle and a dummy. The Tee shirt and Nappy can come off. The toddlers played with it before I managed to get batteries and they were still impressed. Son Son trying to steal the dolls dummy and Ami putting it on and off the potty. When I placed batteries in I was so impressed, it was like all the dolls I wanted as a child. I use to look over the pages in the argos book longing for those dolls that ate things but the best I got was a cabbage patch kid that went in the bath. Well the special thing about this doll is that it talks to you. It can say 48 different phrases and ask for what it wants. Ami loved it especially when it made the noise of needing a poo. She was delighted. Not only that but the doll doesn't just talk it also lights up, how amazing is that. So when its feed food it changes colour meaning it needs cleaning. Its bottom and tummy also light up meaning tummy ache and dirty bum. 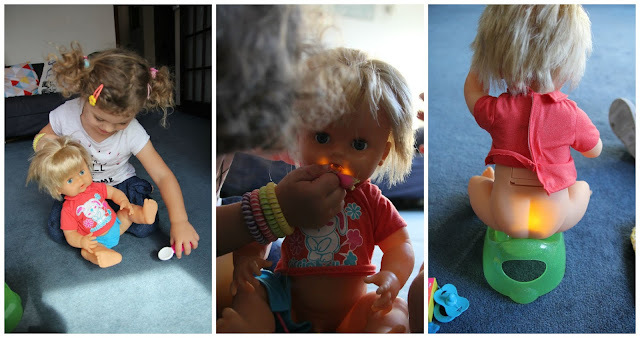 It was really lovely to watch Ami care for her little baby Doll and feed it. I had never seen her do it with anyother of her dolls. The doll was very demanding and quickly wanting things which was helpful as it kept Ami entertained for a long time. The baby did have a slight annoying cry but often stopped when it had its dummy. This Doll provides no mess, which is always helpful for us parents. Although make sure you keep all the bits together as trying to calm a frantic 3 year old as she has lost the babies dummy is somewhat realistic but also very annoying (I ended up tying it on the Dolls wrist). The Cicciobella Rumbly Tummy Doll retails at £49.99 and is a great gift for any child who loves babies. My children from 1 to 8 have loved playing and looking after the baby. Disclaimer: We were sent the Cicciobella doll for the purpose of the review all thoughts and pictures are my own. My Sunday photo - scary arcades. Asti you are 9 years old. Have we been to busy for our kids?